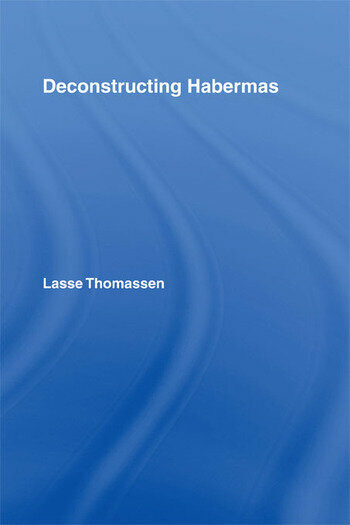 This book is the first book-length deconstructive study of the political philosophy of Jürgen Habermas. Inspired by the work of Jacques Derrida, the book applies deconstruction to key issues in Habermas’s work: rational discourse and rational consensus, constitutional democracy, tolerance and civil disobedience. The war in Iraq brought Habermas and Derrida together in defense of international law and in favor of a bigger role for a united Europe in international affairs. Yet, despite the rapprochement between Habermas and Derrida in the years prior to Derrida’s death, important differences remain between Habermas’s critical theory and Derrida’s deconstruction. These differences reflect differences between post-structuralism and critical theory and between postmodernists and the defenders of modernity. Lasse Thomassen is Lecturer in Political Theory in the School of Politics and International Relations at Queen Mary, University of London. He is the editor of Habermas: A Guide for the Perplexed (Continuum, 2010) and, with Lars Tønder, co-editor of Radical democracy: Politics between abundance and lack (Manchester University Press, 2005).